It's Spring Break here in our part of Texas and we are enjoying not having to run here and there like we do typically. It's been a laid-back week so far and I love it. I like to use kit contents, especially packaging, in fun ways. The rainbow striped paper is actually packaging from the American Crafts foam Thickers in the You Go Girl Dialy Diary kit. 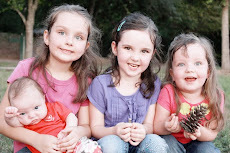 I thought it would be great as part of this page with my girls in their colorful clothes. How do you find time to be creative? I'd love to hear your ideas of how to fit in some creative time amidst all of the other things in life. It was a crazy week last week as we had another out of town gymnastics meet. This was the last one of the season and now it's prep time for the state meet. I've gotten behind on posting here because of trip prep so today I have a new project to share with you. 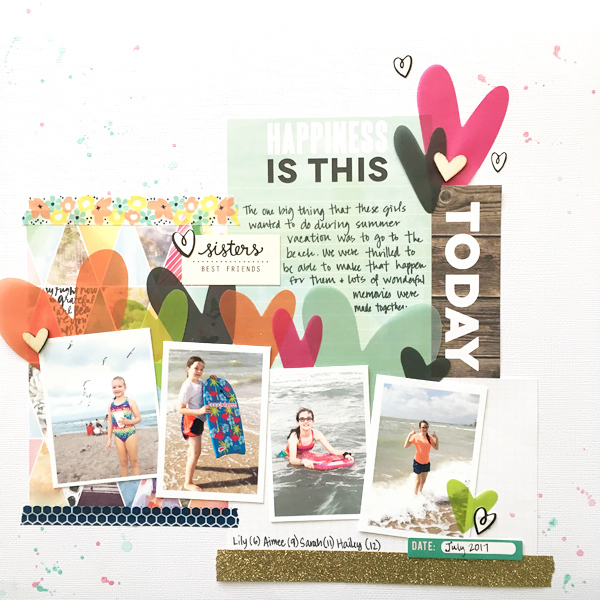 I created this page using the You Go Girl Classic kit from Noel Mignon. Do you ever find silly selfies from your kids on your phone? I sure do, even from my kids who have their OWN cell phones. 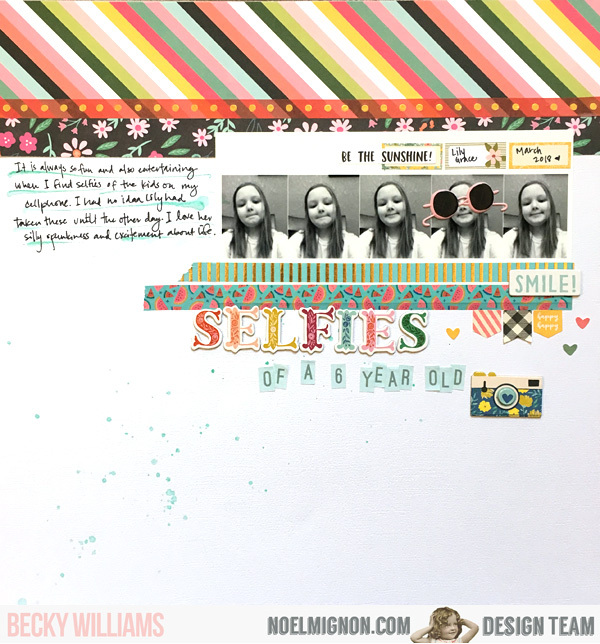 I always love finding these and decided to use some recent selfies of my 6-year-old on this layout. I kept the page pretty basic. Do you tend to go quick and easy on your projects or do you spend a lot of time on the little details? Are you starting to get a little bit of spring fever? 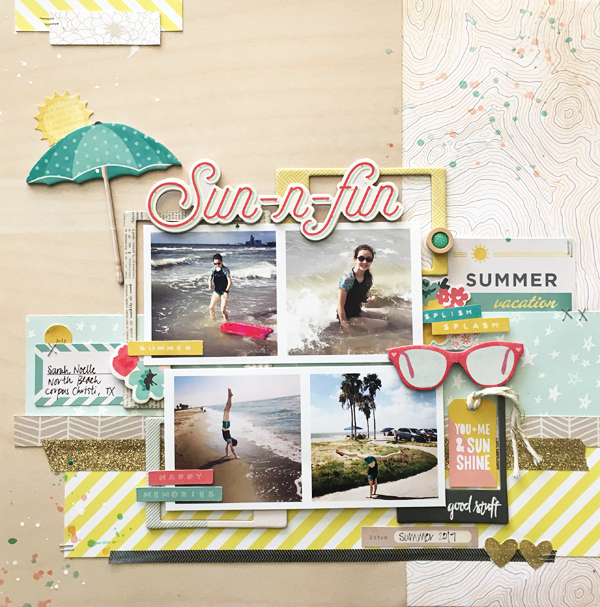 Here is a layout I created with pictures from our summer trip to Corpus Christi, TX. We had so much fun playing in the sun and on the water. There is so much to do there and we had such a great time. I used a mix of Studio Calico and Crate Paper products on this one. I have a project to share featuring the February Noel Mignon kit and our cute little kitty, Crookshanks. Crookshanks became part of the family on December 29 of last year, a birthday gift for one of my girls. While my husband wasn't ecstatic about the new addition he has been tolerant and has even on occasion been known to pet or hold the kitty. I used various household items to trace and then handcut the circles and x's. 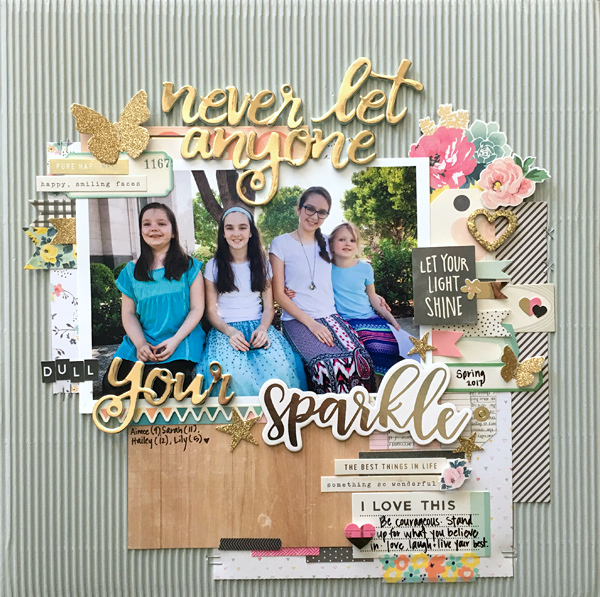 You can read more about the details of how I created this layout on the Noel Mignon blog. When you are working on projects how much time do you spend on each one? Sometimes I sit and it's like I've forgotten to scrap and it takes hours to finish one page and other days I can get a few layouts done in an hour. It's funny how that works. 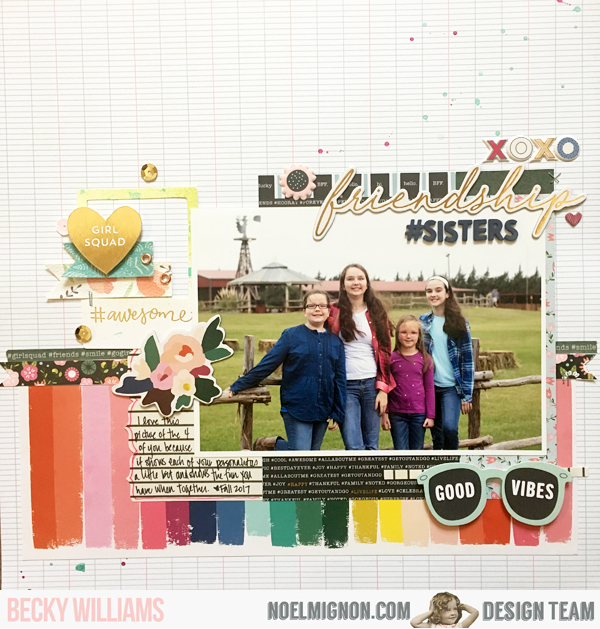 For this page, I started with a white cardstock background and added some spray mist as I like to do on most of my projects. 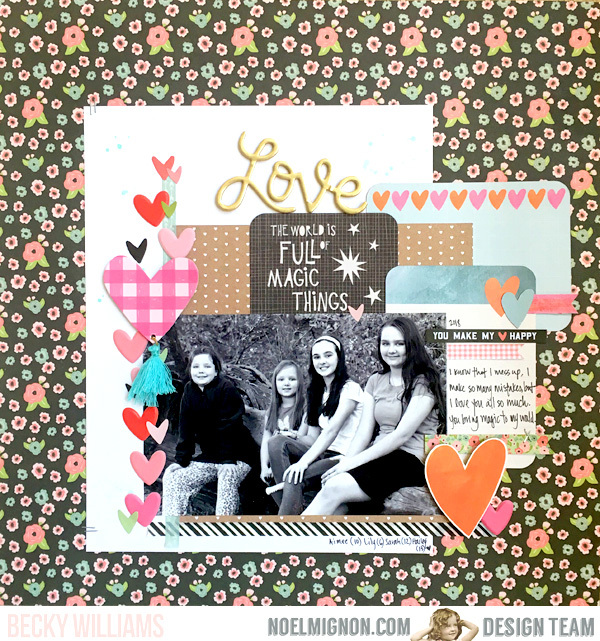 I added the large journaling spots and my photos and then tucked the acetate hearts under the photos, added a few other stickers and some tape and called it good. The hearts had been in my stash for quite a while so it was nice to use them up and they add some fun color to the layout. We're having a bit of a rough start to our day at home and yes, I am escaping from it all by sitting at the computer to blog this layout. It's another that I created a while back for fun and didn't share it. There is a mix of manufacturers on the page. 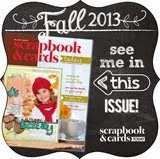 I think there's some Crate Paper, Basic Grey ♥ along with some Simple Stories and Jillibean Soup. The gold tape is something that I had to put on everything for a while simply because I ♥ it. I got on the gold train a little late but it just gives things a special pop that I really like. The stars were cut on my Silhouette machine...they'd been sitting around in a pile of things I cut thinking I'd use them right away but didn't. Do you ever do that? I find it easier to cut a bunch of things that would work on a variety of projects and save them for future use. This page features my two youngest after their swim lesson graduation. They'd been nagging me to get cotton candy and I'd promised them that on their last day of lessons we would get them each their own. Lily's was bigger than her head, ha ha. 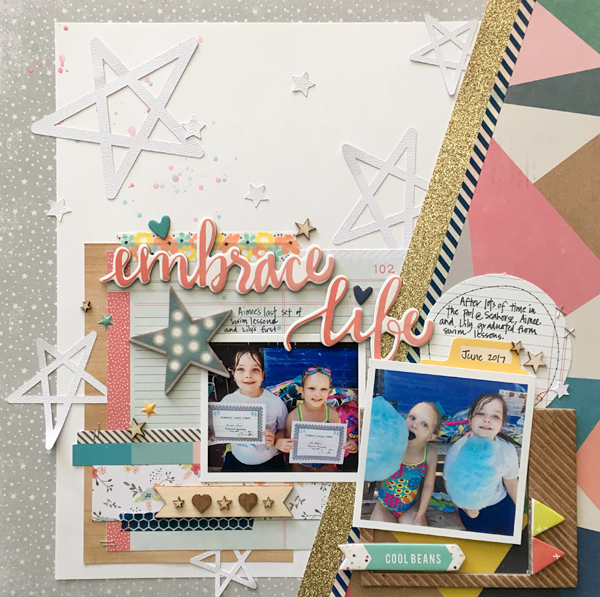 I am really trying to be better about blogging my projects this year so I have another layout to share with you. Instead of creating for an assignment this time, this was just for fun, and I dipped into my scrappy stash quite a bit for this page. 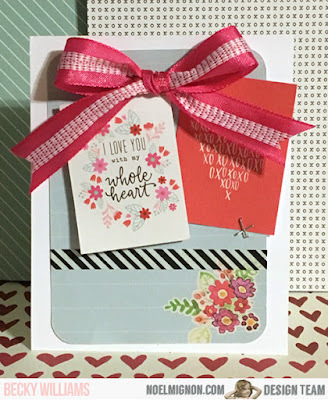 The corrugated paper in the background is from Fancy Pants and the papers are from Crate Paper. The floral washi tape is from Simple Stories, the gold foam alphas from American Crafts. 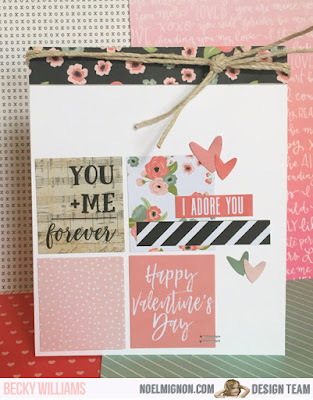 Today will be a quick post sharing a couple of super quick and easy cards I made using the Simple Stories sticker sheets from the February Noel Mignon Daily Diary kit, So Sweet. With the crazy schedule we keep some days I just have to make a project fast, and that's what I did this week. 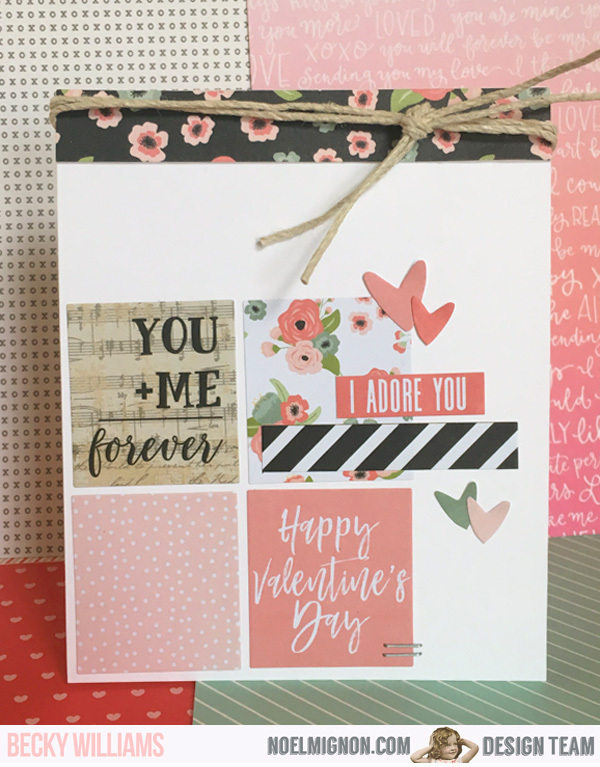 I simply used some stickers, a bit of washi a strip of patterned paper and some twine and these cards were done. Drop a link and I will take a look. I love to see what others are up to. 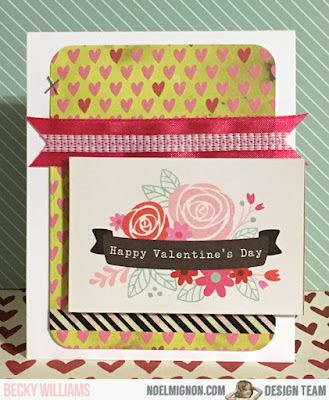 Today I have a few quick cards that I created in honor of the upcoming Valentine's Day. These were all created using the February Daily Diary kit from Noel Mignon, So Sweet. 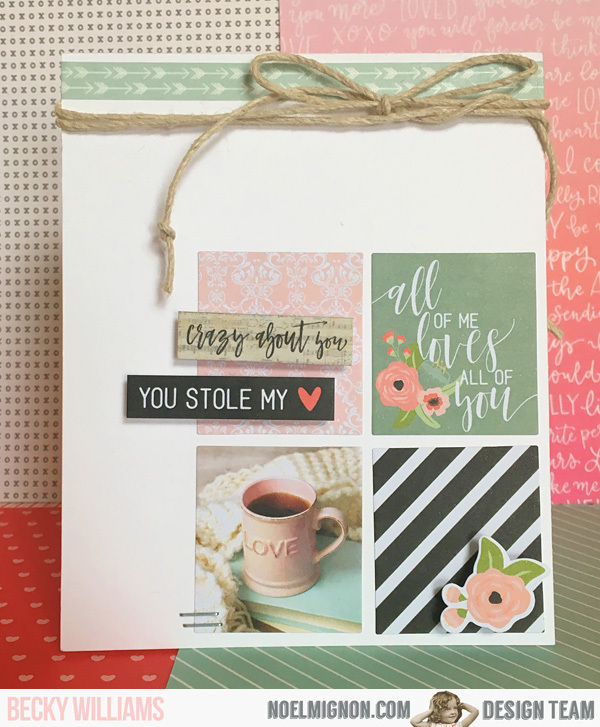 Each of these cards were created using pocket page cards, which makes for a quick and easy project. 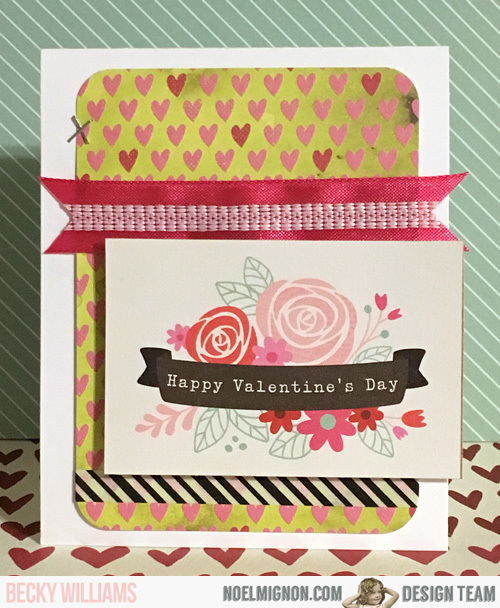 I simply added some little diecuts, flowers, tape and ribbon to finish the cards. They're all ready to go for Valentine's Day! This kit is a mix of product from Simple Stories, Pebbles, American Crafts, Carta Bella and more. 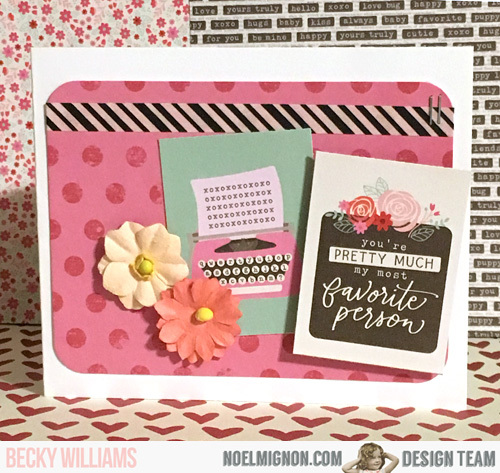 Noel does such a beautiful job of coordinating products from many companies but that go so well together to make any kind of papercrafting project. 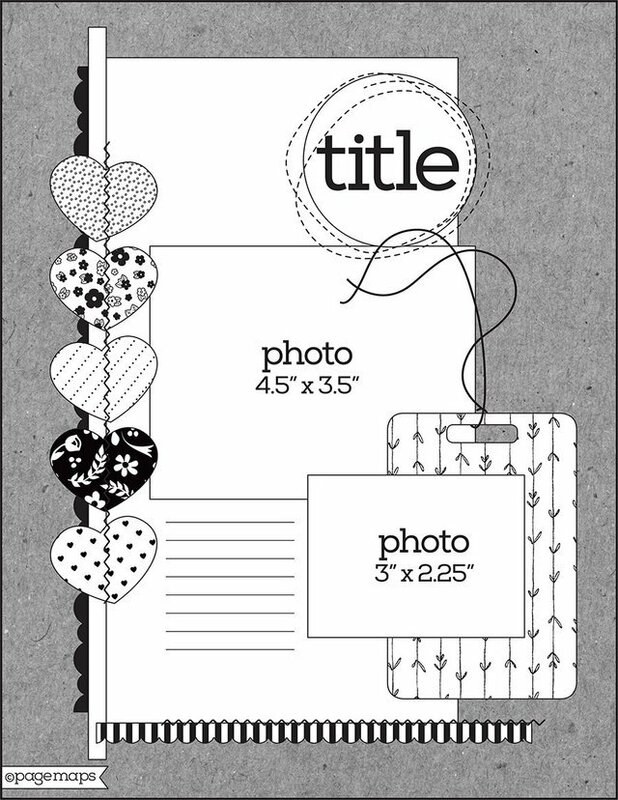 My page this week is based off of a February PageMaps sketch by the wonderful Becky Fleck. You can see more details of my page on the Noel Mignon blog today. If you are still in the process of raising children, be aware. The tiny fingerprints that show up on almost every newly cleaned surface, the toys scattered around the house, the piles and piles of laundry lying around to be tackled, will disappear all too soon. And, you will, to your surprise, miss them profoundly. How to make great Black and White photos!